Louisville, Ky. – Gene Keady was at the KFC Yum! Center Thursday night. For decades, he WAS Purdue basketball. Famous for his scowl. Famous for his combover. After watching an instant classic, he was warmly greeted by ecstatic Purdue fans as if he were still the winning coach. No. 3-seed Purdue survived arguably the best game of the tournament, squeezing by No. 2 Tennessee in overtime 99-94 in the South Regional semifinals. The Boilermakers (26-9) advanced to the Elite Eight for the first time since 2000. If they upset top-seed Virginia (32-3) on Saturday, they will reach the Final Four for the first time since (drum roll, please) 1980. For a long time, Keady was the other rock star coach in basketball-crazy Indiana. He never enjoyed the kind of success his cantankerous counterpart Bob Knight at Indiana University (Although, he did own a 21-20 against The General). Heck, he never made a Final Four. 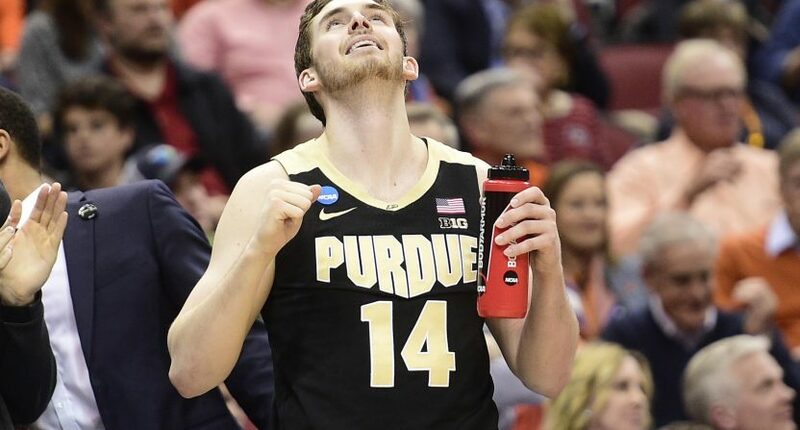 Perhaps Keady will feel some sense of satisfaction in seeing his protégé get the Boilermakers to a place they haven’t been in almost 40 years. One game away. And how it all went down Thursday was remarkable. Purdue dominated the first half and the first 30 minutes of the game, leading by as many as 18 points in the second half. Tennessee dominated the remaining time of regulation, going on a 14-0 run to tie the score at 65. It looked like the Volunteers might win in regulation after Grant Williams’ follow-up basket with 8.8 seconds left. But with 1.7 second lefts, Purdue scoring machine Carsen Edwards was fouled on a 3-point try. After missing the first, he made the next two to send the game in overtime. In OT, Purdue regained its mojo, never trailing in the extra session. “Man, that was obviously a great game,” coach Matt Painter said. Painter played for guard Keady in the early 1990s. He succeeded Keady as coach in 2005. In 14 seasons, Painter has guided Purdue to the Sweet 16 five times, including this current run of three straight (Only Kentucky, Gonzaga and Michigan have done that as well). Getting to the Elite Eight is a breakthrough. But a Final Four trip will separate Painter from his mentor. He’s on the verge after an outstanding effort and a little luck. This game was bizarre. In the first half, you saw one reality. In the second half, it was the Upside Down. Normally when one team makes 15 3-pointers in a game, it’s a blowout. Normally, both teams don’t shoot the same from beyond the arc as they do from the stripe (Purdue: 15 of 31 from 3-point range and 16 of 33 from the free-throw line. Tennessee: 12 of 24 from 3-point range and 14 of 28 from the free-throw line). There was nothing normal about this game. The first half reality: Purdue’s length completely flummoxed the Volunteers. Tennessee did not see that kind of defense last week in Columbus when it beat Colgate and Iowa. The Boilermakers have pterodactyl defenders. Matt Haarms, a 7-foot-3 sophomore, erases mistakes. The big man from Amsterdam led the Big Ten in blocked shots and the ones he doesn’t swat away, he can alter. And what about Nojel Eastern? He’s listed at 6-6 but has a wingspan of 6-8 and can cover a lot of ground. The defense helped Purdue grab a 40-28 lead. The second half, Upside Down: Suddenly, Tennessee’s offense could not be stopped. Perhaps it was the Volunteers raw athleticism. Maybe some key offense adjustments from coach Rick Barnes. Whatever happened, Tennessee exploded for 54 second-period points. “You knew if you watched Tennessee on film, they have these unbelievable runs,” Painter said. There were two heroes for Purdue. One was expected. Carsen Edwards did Carsen Edwards things, scoring 29 points. But who would have guessed that senior guard Ryan Cline (27 points on 10 of 13 shooting (7 of 10 from 3-point range) would have the game of his life? Cline scored all but five of his points after halftime. His 3-pointer with 37 seconds left in regulation tied the score at 80. Williams looked like he might be the hero when put-back Lamonte’ Turner’s miss late. Then, there was the foul call everybody – especially Tennessee fans – is talking about. Purdue controlled overtime. The punctuation mark was a dunk by Haarms to put the Boilermakers ahead 91-84 with 1:38 left. This crazy game sets up an Elite Eight matchup of two schools that haven’t been to the Final Four in a while. Virginia was last there in 1984. Somewhere from the stands on Saturday, Keady will be watching.